One of my favourite ingredients to use during the fall is sweet potatoes. They’re bold sweet flavour and texture makes them the perfect ingredient to use in a variety of fall dishes. You can cook them up as a side, use them in dessert, soup, curry…there are just so many possibilities! One of the most recent ways I’ve discovered to use sweet potatoes is spiralizing them. 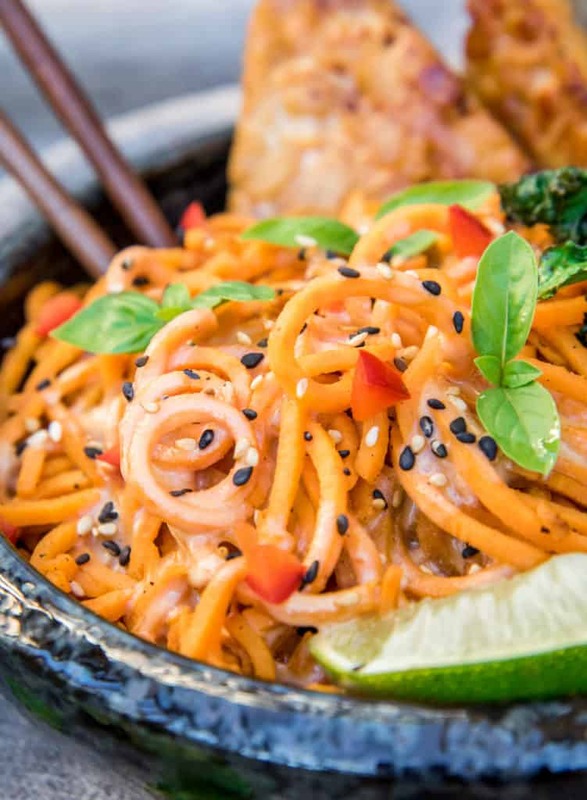 Spiralized sweet potatoes make a great alternative to regular spaghetti. They are filled with nutrients, vitamins, and are a healthy carb. There’s also just something really satisfying about eating a big bowl of creamy sweet potato noodles on a cool fall day. 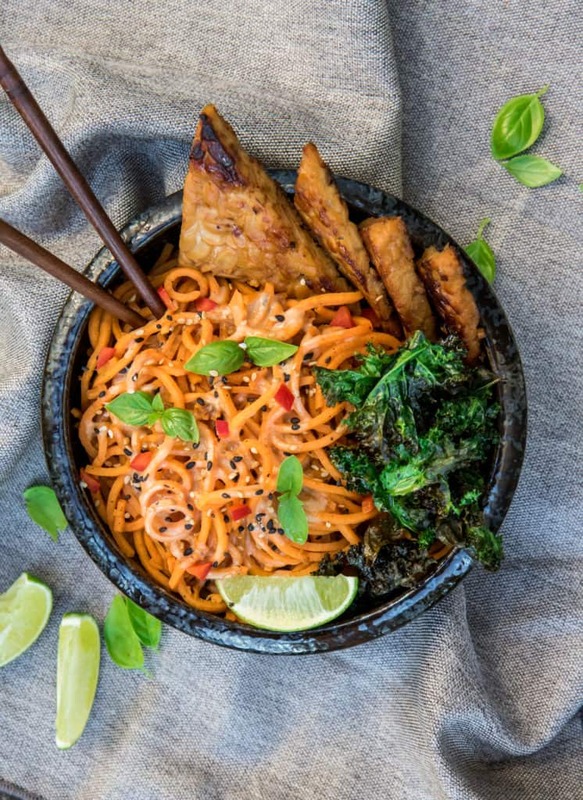 This recipe for creamy sweet potato noodles with garlic tempeh and crispy kale is the perfect healthy comfort food! 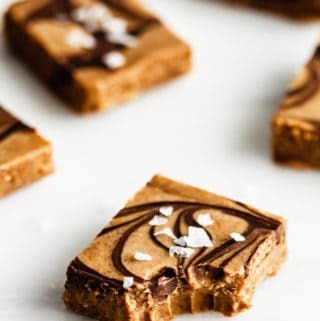 It’s completely vegan, gluten-free, and loaded with healthy veggies. 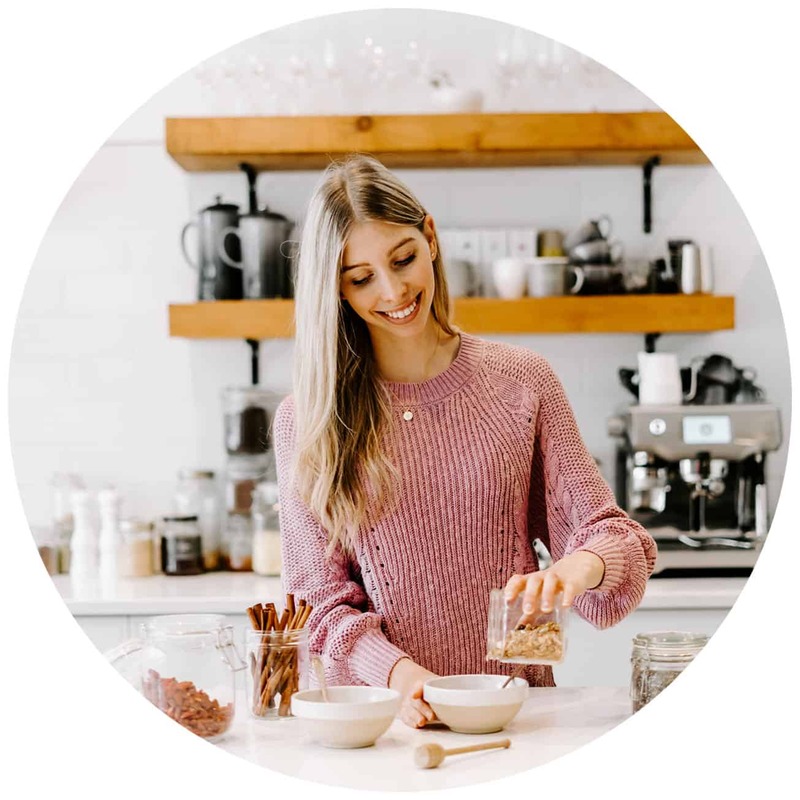 Tempeh is a fermented food, that is loaded with probiotics to help keep your gut healthy and boost your immune system. Mix your minced garlic, maple syrup, soy sauce, and sesame oil in a bowl. Add your block of tempeh and allow to marinade for 2-4 hours, flipping half-way through so each side can soak up the marinade. 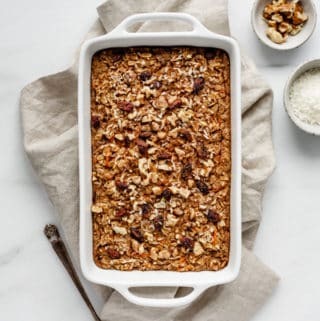 Line a baking sheet with parchment paper and preheat the oven to 425 degrees. Rinse the kale and pat completely dry. Drizzle with olive oil and massage with your hands until evenly coated. Sprinkle with salt. 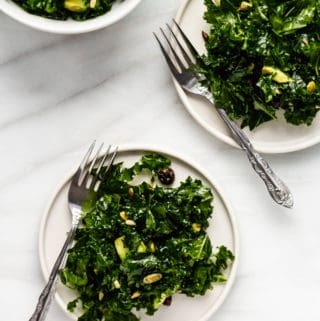 Place your kale in the oven for 5-10 minutes, until crispy. Depending on your oven, you may want to keep an eye as it can crisp up pretty quickly! Next using a spiralizer, spiralize your sweet potato noodles, set aside. To prepare the creamy sauce, mix the coconut milk, maple syrup, soy sauce, sesame oil, and sriracha in a small saucepan on medium-high heat. Allow to boil down for 2-3 minutes so the sauce thickens. In a large skillet, heat 1 1/2 tbsp vegetable oil. Cut your tempeh into triangles or cubes and add to the pan, cooking for 2-3 minutes on each side on medium heat. Remove from pan. Add another tbsp of vegetable oil to the pan and add your sweet potato noodles, tossing regularly for 2-3 minutes. Add 1/4 cup of water to deglaze the pan and cook noodles for another 2-3 minutes, until tender. Pour in your creamy sauce, stir, and remove from heat. 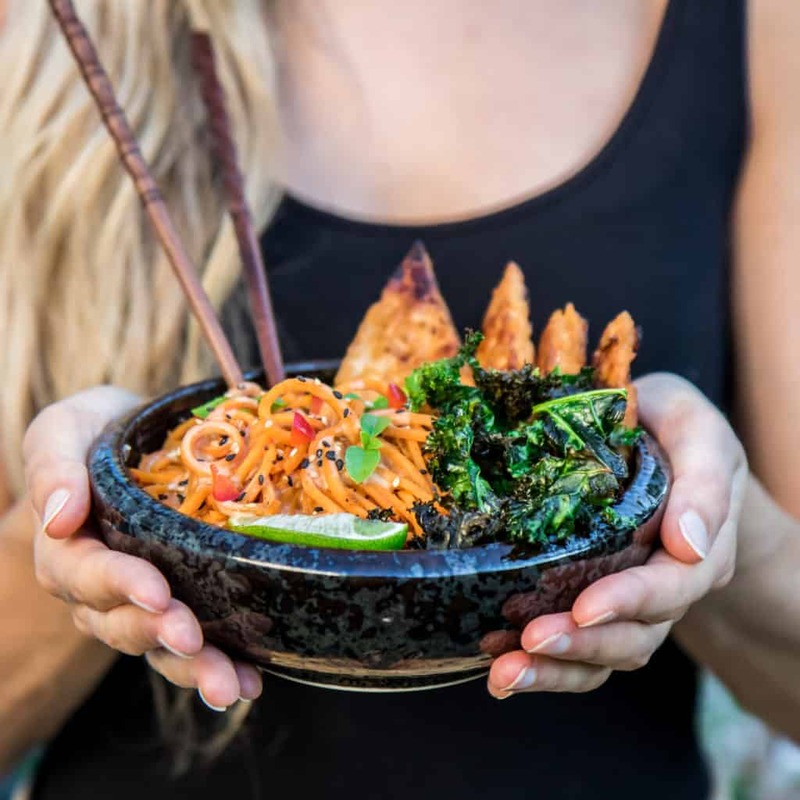 Assemble your bowl with sweet potato noodles, garlic tempeh, and crispy kale on top. garnish with fresh herbs, lime, and sesame seeds if desired. *Don’t have tempeh? Simply use tofu instead! Stunning as usual Jess, this looks like a wonderful meal! I can’t believe I’ve never tried spiraled sweet potatoes…that must change. I love that this time around the ingredient could go sweet or savory, and it seems we did half and half 🙂 Thanks for being a part of it! Thanks so much! I’ve just recently tried cooking with them and fell in love! This sounds like such a tasty meal, Jess! 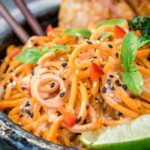 I love sweet potato noodles and tempeh, pairing them together is even better! I’ve had a problem with my sweet potato “noodles” falling apart after a couple of min. Of cooking. Any ideas? Try cooking them on a lower temperature for a shorter amount of time. I like to put some oil in my pan, cook them in that on medium-high heat for 1 minute, and then add a bit of water to steam them for another minute or 2. Then remove them from the pan immediately!